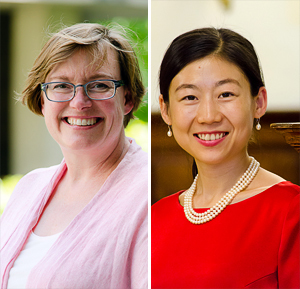 The Faculty of Law is pleased to announce that Professor Andrea Bjorklund, L. Yves Fortier Chair in International Arbitration and International Commercial Law, and Professor Kun Fan have been appointed Norton Rose Fulbright Faculty Scholars in Arbitration and Commercial Law. Professor Bjorklund was appointed for one year; Professor Fan, for three years. The previous holders were Professor Fabien Gélinas, before he became the Sir William C. Macdonald Chair, and Professor Frédéric Bachand, before his appointment to the Superior Court of Québec. As holders of these Faculty Scholarships, Professors Bjorklund and Fan will be able to support a rich program of activities in international arbitration and commercial law. The Norton Rose Fulbright Faculty Scholarships were made possible thanks to a very generous gift from Norton Rose Canada (formerly Ogilvy Renault) to which nearly 85 % of McGill graduates at the firm contributed. Sharing the news of the appointment, Dean Robert Leckey highlighted the professors’ excellent past performance, and sterling future promise. “I look forward to seeing how they will advance their research in this field and what the graduate students they support will accomplish”, he concluded. Please join us in congratulating Andrea and Kun!